John Calvin, Martin Luther, Francis of Assisi, even Saint Paul believed that the natural world is a reflection of God’s own nature. In the first chapter of the book of Romans, Paul writes that “God’s invisible qualities -- his eternal power and divine nature” can be “clearly seen, being understood from what has been made.” In fact, Paul even suggests that perhaps nature is the greatest evangelist, allowing people who may never meet a missionary to see in nature a reflection of God, just as a mirror shows a reflection of a face -- imperfect, but very close to the original none-the-less. One might think, therefore, that Christians would be at the forefront of conserving and protecting God’s creation. In fact, the second chapter of the book of Genesis says that “God took the man and put him in the Garden of Eden to work it and take care of it.” One could make the argument that man was made with the purpose of caring for the rest of God’s creation. And certainly there are many Christians who have taken that call to heart. They ask questions such as “What Would Jesus Drive?” and they seek to “Reduce, Reuse, and Recycle.” But there are others who feel that environmentalism is either a distraction caused by Satan or a movement started by and for pantheistic earth worshipers (and therefore is something Christians should steer well clear of). 1) God has provided the planet and all that is on it as a resource and provision for humanity. Proper management of this resource must be sustainable, keeping future generations in mind. The planet is a blessing. God made it to be a sanctuary for life and therefore it should be treated with consideration. 2) Nature is "a portrait of God's beauty." In fact, Robinson points out that "it's in nature that we oftentimes see not only the beauty but also experience the real presence of God." To damage this portrait that God has created of himself is to dishonor him and to endanger our own credibility in the eyes of humanity. 3) Caring for the environment can be a means of missions work. Many of those who are hardest hit by environmental degradation are "the least of these." Rather than receiving God's provision through his creation, they suffer without clean water and with ravaged soil -- the results of a misuse of the planet. By restoring the environment, Robinson says, we help to restore "the neglected assurance of God's abundant presence" as reflected in the provision of the earth. 4) Caring for the environment can be a means of evangelism. What environmentalist would take even a moment of their time to listen to the gospel from the lips of an SUV driving, pesticide spraying, disrespecter of God's creation? How much more readily might they be willing to listen when they see that a Christian's faith permeates every area of their life? 5) The renewal of God's creation is the last of a widening circle of renewal that God works in his creation, starting within the hearts of individuals and rippling out through our bodies, our homes, our communities, and the world. 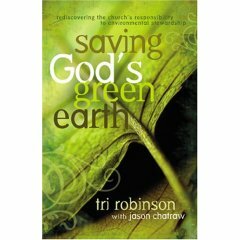 Robinson intersperses each chapter of this book with examples of present day Christians who have felt called by God to take environmental concerns seriously. He understands that there are political and social pressures within the church that can be daunting, but he devotes an entire chapter to encourage the reader to heed God's call to care for the environment. (It's a powerful chapter, in fact, on having the courage to take the first step in obedience to any call which God has placed upon us, not just a call to care for the environment.) The final two chapters of the book provide practical guides for practical responses, first in terms of education and then in terms of taking action. I have written several short essays on the topic of Christianity and the environment and therefore have given quite a bit of thought to the topic. I was pleased, however, as I read this book that though much of what Robinson wrote was old hat to me, there were also several points that he made and connections that he pieced together that were either new to me, or said in such a different way that they took on a beautiful new nuance. Robinson understands his audience well (He's a pastor of a church in Boise, Idaho.) and is gentle on his reader (who may feel a little panic-y when approaching this topic) and yet he doesn't hold back on his challenge to the reader to take seriously the care of God's creation. This book is an easy read and would be well suited to discussion groups. It is full of Scriptural references and may be appropriate therefore for a Sunday School class or Bible Study group. I strongly recommend other Christians to read this book. If you're not a Christian, but know someone who is (and who isn't environmentally conscious) this might be a great book to hit them over the head with (or you could just get them a copy for Christmas). What does it say about [ Revelation 11:18 ], I wonder? That's always been one of my chief references to hit people over the head with. Also, the National Association of Evangelicals is starting to talk about "Creation Care", much to the chagrin of a few. "The time has come for judging the dead, and for destroying those who destroy the earth." I'm in the middle of Omnivore's Dilemma, now. It's a really great book. Polyface Farm is not far from Charlottesville, just the other side of the mountain. I'd like to visit. There's an interesting article I'm working my way through (math) called "Diet, Energy and Global Warming" by Gidon Eshel and Pamela Martin. The basic premise is that switching from an "American" diet to a vegetarian diet reduces your carbon footprint more than switching from an SUV to a hybrid. Both would be better. Buying locally would be better still. I'm considering buying Saving God's Green Earth for my crazy Christian brother who lives on 40 idle acres with my parents. we're doing a CSA this summer. i'm both excited and nervous at the same time. it's going to be a challenge using the food as it comes in (as opposed to buying only what i want when i want to). that's why i'm trying to start with the chives (and rhubarb) now and try to get myself in the habit of eating food when it's ready to be eaten and not when it's been trucked in from a green house in cali. the diet, energy and global warming premise sounds like the saving water suggestion in this article. doing the obvious isn't always the best solution. Yeaaahh, not interested. You're right. When are you coming to visit me? yeah, you should read Omnivore's Dilemma instead. you'll laugh. you'll cry. you'll run to the nearest trash can to barf up everything you've just eaten. it's great! we're thinking early august now. maybe 2 - 9. Well, the environment played a key role in my coming to believe that Jesus of Nazareth was, in fact, the Messiah. More specifically, becoming aware of the incredible damage that we (Americans as a whole, scientists, modern agricultural producers, and other "modern" countries) had caused to the environment (the lakes, the rivers, the air, the sea, the animal world) and the food supply (pesticides, preservatives, denudation, etc.) made me realize that our science and knowledge was flawed and imperfect, and filled with motives that were not always honorable. As I began to study nutrition serious (I became a avid health food eater long before I become a follower of Christ) I began to realize that much of what we (scientists and food manufacturers) did to food actually made it far worse for us. The two food items for which this became clear first were white flour (vs whole wheat flour) and white sugar (vs. unprocessed sugar cane, or other whole sweeteners). Everything I read pointed out what should have been obvious: the refinement of these two items lead to a reduction in nutritional value of the food substances. What solidified this for me personally was the effect that eliminating just those two items from my diet brought: my energy level was was better and with fewer ups and downs. Basically, I felt much better and healthier. I then realized that food had a specific design to it. For example, a wheat kernel naturally has the health bran (for fiber) and germ (for additional nutrients). This suggested to me that there was a design (by God) and that it was better than what humanity could accomplish. There were similar discoveries for me in analogous areas (e.g. pesticides really weren't better - in the long run - than the natural system, as they poisoned the rivers, and lakes, and resulted in resistance in the insects). I was very puzzled after I became a Christian to go to churches and find people either apathetic (which I could bear) to at times a bit dismissive. Frankly, I feel that the natural world speaks volumes about God's majesty, and its destruction speaks volumes about Man's warped nature.